Years ago while I was in business school I worked part time as a church secretary (no lie!). One year around Easter time I noticed, and smelled, the little old ladies from the church concocting something in the kitchen. Being nosy and hungry I wondered down to the kitchen to see what was brewing. What I found was them making these home made chocolate peanut butter cups. After hanging around and sampling a few they invited me to help make some. These are beyond yummy and so easy it's not right. I used to pour these into tiny little paper cups like the church ladies did but one time when I was out of the cups I tried it in a pan and it works just as great. -Pour all ingredients in a pan and constantly stir over low-medium heat till melted and smooth. 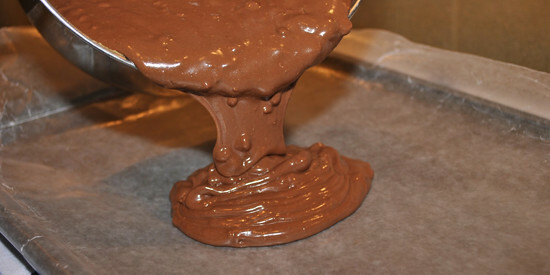 -Then transfer to a wax lined cookie sheet or cake pan. -Place in refrigerator or freezer till solid and hard. If in one pan-score and cut into small pieces. This weekend I'll be busy with family-celebrating my nephew's 5th birthday. So sad how fast time goes, but its fun to see them grow in to little adults :) Hope you all have a fantastic weekend! Also really love your [signature] shoe icons! Oh yum! My favorite combo.